A bright Spring coat, such as my bright pink wool version from J.Crew, is a must-have for this time of year. You're sick of your heavy down winter coat, right? Me too. Investing in a transition coat (or a few, I also have a seafoam green coat and a red trench!) bring color and light to your wardrobe while still keeping you warm on the days Spring decides to be not-so-nice. Oh Spring! How tempestuous a season you are! Snow, rain, "wintry mix", this abominable thing called "freezing mist" and then...bright, glorious blue skies! How my heart soars! I'm absolutely LOVING my sky-blue nail polish from Sinful Colors (Bright Lucite-dont'ya love that name?!). 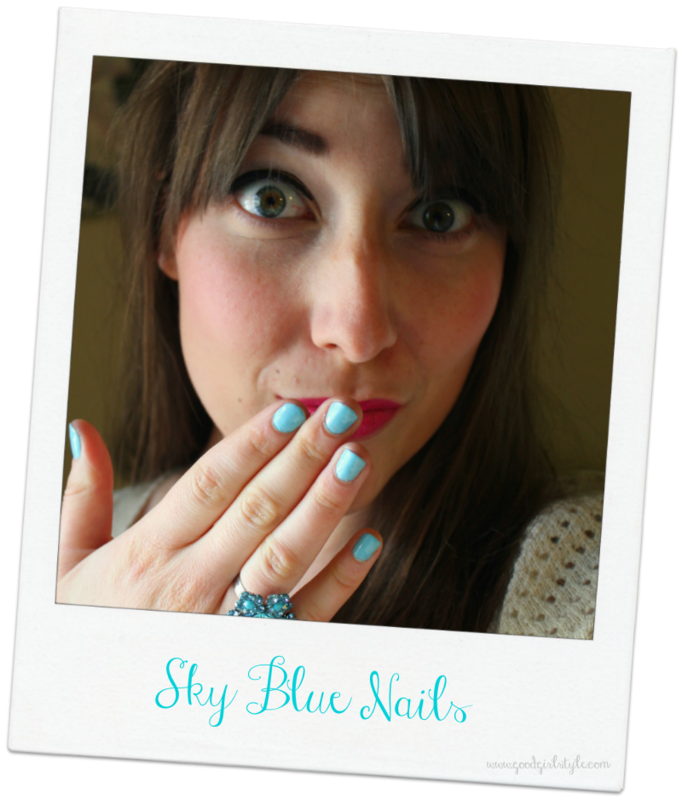 Glossy, gorgeous blue sky nails are a sure-fire way to bring some brightness to your wardrobe (and your life!). What are some ways YOU add color to your life this time of year? Do you have a bright rain coat, umbrella, wellies, or a favorite shade of nail polish? Let me know in the comments! It feels like summer already here in Lakeland. Kinda jealous of your cute coat. You're ADORABLE! :) I just bought some neon yellow, bright blue, and neon purple. Needed to add some spring-y brights! @Alexandra: How fun! And that umbrella? Sounds adorable! @Katie: OOoo the neons sound amazing! I have a neon pink that I love but it wreaks havoc on my fingernails. I can't wait to see yours!